Mr. Rhett, exhausted after his computer work. I spent some of my Christmas money. Yes, I know, it's almost July but these days I put a lot of thought into something before getting it. I bought a DVD burner, easy to plug in and install the software; this should take a few minutes. Right! Murphy's first and second laws of computer work quickly ensued. First law? Anytime you think it will take five minutes, allow at least two hours. Second? ANY change in computer configuration will result in at least three important programs or devices crashing. This will add an additional two hours to the process. I wanted to pull my hair out. Mr. Rhett wanted to help. No, not help pull my hair out; he fancies himself quite the computer whiz. After all, he always sleeps under the desk next to the tower. So, he proceeded to sniff all the cords and play with the twisty ties; then he chewed on the plastic bags covering the burner and the cords. After trying to walk on the keyboard and stuff himself into the empty DVD burner box, he was exhausted. 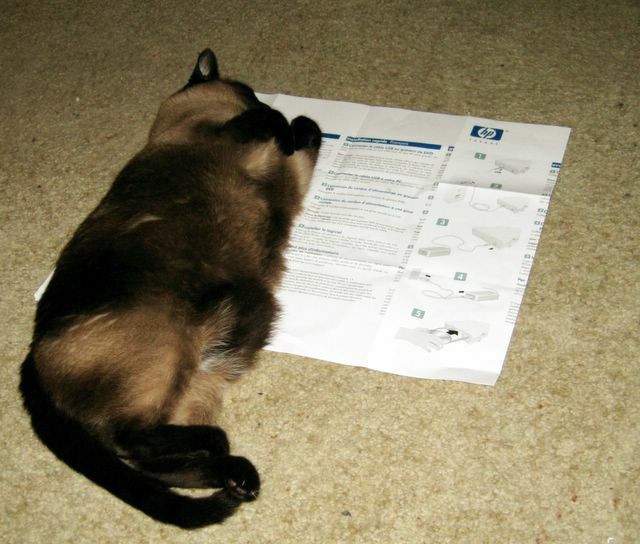 I guess he thought I no longer needed the installation instructions. Yep! What better place to take a nap? Mr. Rhett will be refreshed for Friday's Ark and for the Carnival of the Cats, hosted this week by Watermark.